We are beginning to live in a world where fame is starting to become more important than money. We’re not there yet, but we’re getting there. Several factors, I assume, made this possible – not least of which is food security. The world creates 1.5 times as much food is needed for the human population, although many people are malnourished due to distribution problems (see here.) Still, for many people in the West, the needs of *survival* have been met, so different needs begin to take priority. Maslow’s Hierarchy of Needs – food supply is “Physiological” aka the red block. We have solved problems that have been defining humanity for millennia, so now nearly all of American society is operating within the top 4 needs. “Safety” is still an unmet need for many Americans, particularly the homeless, but an ever increasing percentage of the population is primarily concerned with the “Social” and “Esteem” levels of need, which is exactly where fame lies. I expect, and hope, this obsession with fame will spread as increasing numbers of the world population have their physiological and safety needs met. If fame becomes a big enough, money may become a thing of the past. Eventually. We’re a long way off, but people already work for free – on wikipedia, in open source, and contributing articles for journals. I write this blog for free, for the benefit of both my readers. Working for money has ceased to be a way to generate respect in the community. The richest people in the US are beginning to be resented by the population, and historically, high levels of resentment have not been sustainable. In the past, they led to revolution and revolt – but there is no need for things to get so violent in this technological age. Back in the day, wealth and fame went together, but that link is being broken. The internet is essentially the exultation of the every-person so no longer will you have to be rich to get famous, and fame is no promise of wealth. This is one short step from money being de coupled from power, which would be astounding. Sure, rich corporations can buy congress – but at the end of the day, congress relies on elections, and fame has the ability to trump cash. Right now, money is often used to *buy* fame, but someone who already had fame wouldn’t need it necessarily. We may actually be at the start of a culture transcending money in many ways, yet it is unlikely to produce a utopian paradise. Resource scarcity will be replaced by attention scarcity, where we battle each other for the spotlight. Our physical manifestations will become less important as we build up these hollow online personas, and yet it is still a step forward – but toward what? 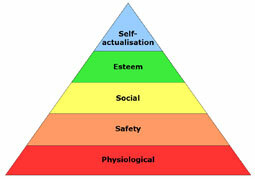 What is our ultimate self-actualization as a society? I can’t answer that, but I do have faith in it.